As an advisor in the digital age, you know that having a website is not only a smart marketing tool, its a necessary part of your business. This means you should always be looking for new ways to update and improve your site for optimum consumer experience. 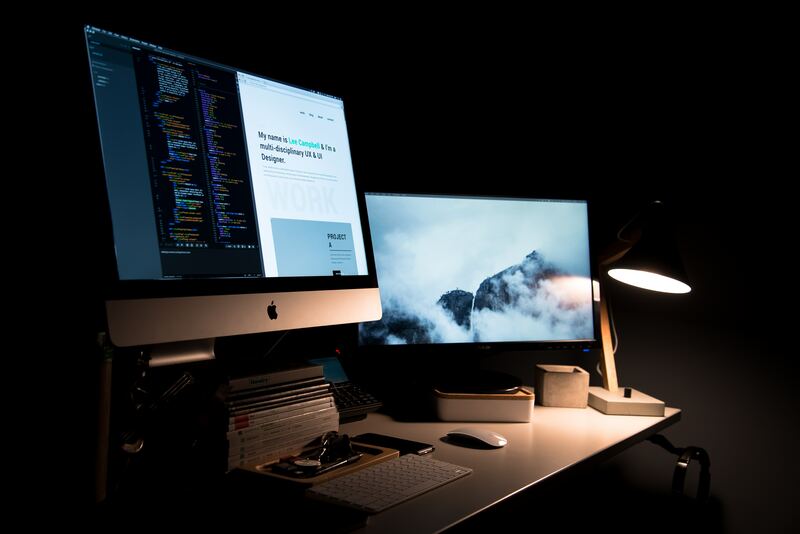 While your entire website is important, there are a few pages you’ll want to pay special attention to because visitors and potential clients tend to click on and spend more time on certain pages over others. Making the most of these web pages in particular allows you to place your best content where the most people will see it. If you know where to emphasize your firm’s unique services and skills, you’ll have the best chances of getting new clients out of your website visitors. 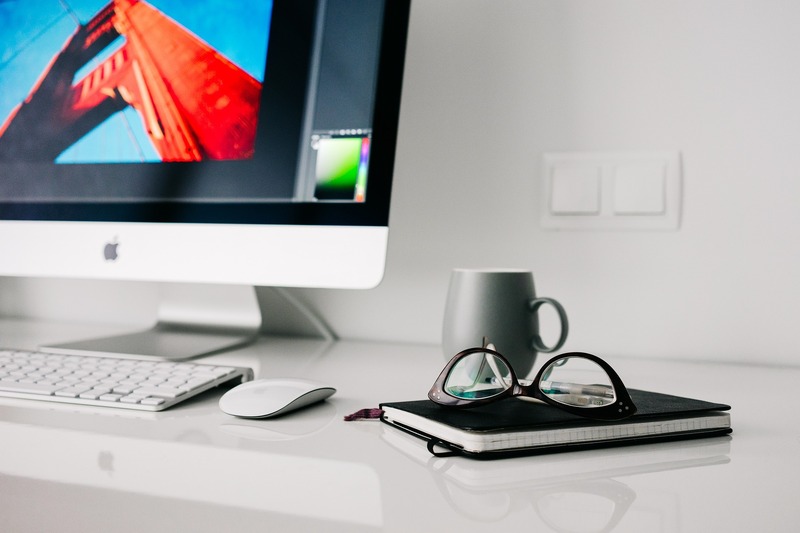 So make sure you’re taking an extra look at these four key pages on your website! This one goes without saying. As the first page visitors land on, you need a strong and professional homepage to make a good first impression. According to Hubspot, 55% of visitors spend fewer than 15 seconds on your website. This means you need to convey your firm’s personality and value very quickly. The first thing you should focus on is a strong tagline. This should be prominently displayed on your homepage. You want to develop a concise headline that accurately portrays your USP (unique selling proposition). Visitors to your site should be able to immediately tell what you do and how you can help them. 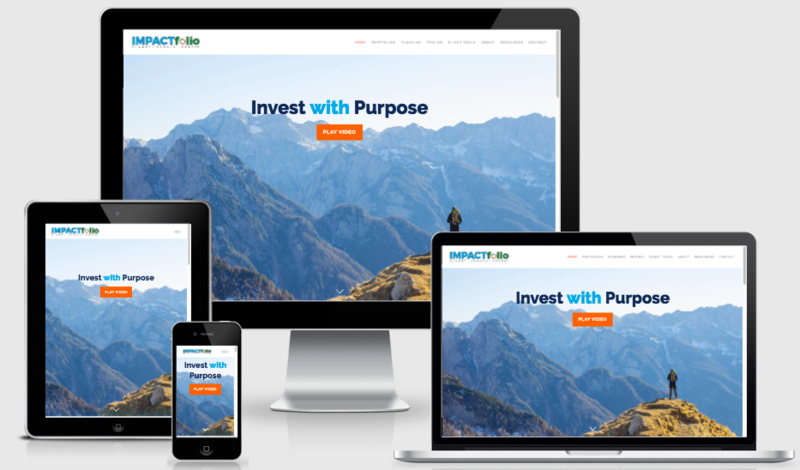 Twenty Over Ten client,IMPACTfolio, focuses on socially responsible investing, so they incorporate that into their tagline and use nature-related photography. Another thing to pay attention to is the pictures you use. A picture is worth a thousand words, so make sure the images on your site are consistent with the brand you want to establish. For example, if you work mostly with families, your pictures will be much different than if you work with physicians. You can also try using local scenery or landmarks if you’re primarily targeting a local audience. Don’t forget to incorporate your logo somewhere promidently as well. Doing so will help visitors immediately recognize your brand. Twenty Over Ten client, Pivotal Financial Services, uses local New York City scenery to set the tone on their home page. If there’s a certain video or graphic you’d like potential customers to see right away, you can add a link or screenshot of it to the homepage. This will draw their focus to it right away instead of them having to search your website and skim over it. After the initial homepage visit, we’ve found that customers then navigate to the about page. Because they’re looking to find out more about your company and potentially do business with you, you should really take this opportunity to sell your firm. However, this should not resemble any sort of sales pitch. That comes across as too aggressive and potential clients will quickly be turned off. Instead, think of it more as telling your story. Focus on what makes you qualified and experienced. Let your excitement and passion for your business be known. 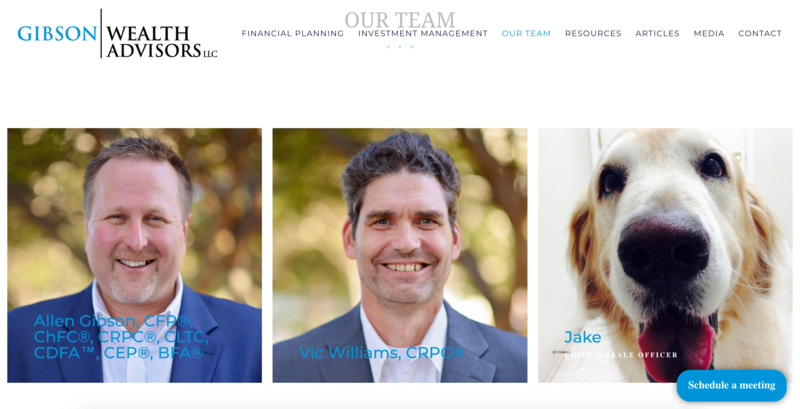 Twenty Over Ten client, Financial Planning Done Right, uses the “who we are” section of their website to tell the full story of how their firm was born. This is also another opportunity to show how your firm is unique. There’s no doubt that you have an interesting reason for starting your firm and that you’re proud of becoming an advisor. People can to relate to this and getting to know more about you and your firm helps them feel more connected. Get creative with your bios and feel free to show events your team has done and any special interests or talents that could help your clients. Gibson Wealth Advisors includes their “Chief Morale Officer” in their bio to show off their firm’s lighthearted personality. You do, however, want to make sure you give potential customers a very clear understanding of what your company offers. If they don’t specifically know how you can help them, they may get frustrated and move on. If possible, be fairly transparent about fees, minimum assets and the types of clients you work with. You’ve probably heard nonstop about the importance of blogging. Content marketing is a huge trend that’s not going away and a blog can be a great investment of your time. However, you may not know that research has shown that most users land on blog articles through organic search rather than on your blog’s home or landing page. This gives you the job of getting your readers further engaged. The most common way to do this is including CTAs or calls to action within each individual blog article. These can encourage clients to do anything from schedule an appointment, visit your website, like your social media, etc. Whatever it is, you should be encouraging readers to take some sort of action or next step in every post. 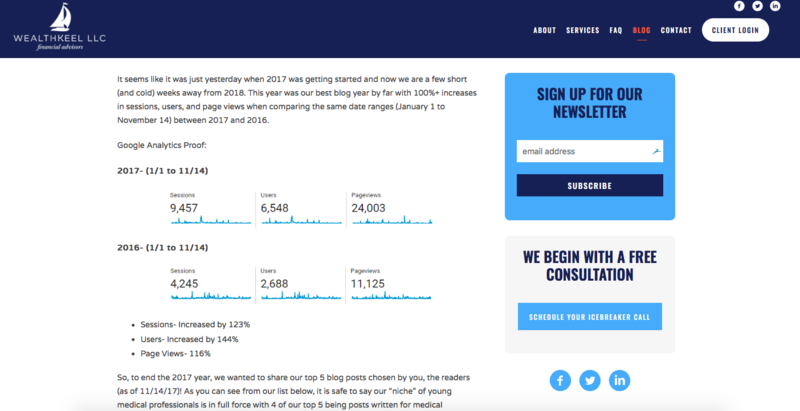 Twenty Over Ten client, WealthKeel, includes CTAs for a free consultation and a newsletter sign-up on their blog posts. Your blog is also a really great opportunity for you and other members of your team to put your thought leadership and expertise on display. You can show your clients the depth of knowledge you have, instead of simply telling them. Make sure you focus on the skills and subjects that may be unique or help you stand out from other firms. For example, if you’ve done a lot of work with socially responsible investing, make a few posts about it. This gives you a way to expand on your specialties. Essentially, a blog creates an opportunity to further sell prospects to make a final decision to work with you. Take advantage of it! These should also all be available “above the fold,” meaning they’ll be visible in the browser as soon as it loads without having to scroll. This keeps you from cluttering this space too much. You want to keep this page pretty simple so customers have no confusion about how to get through to you. 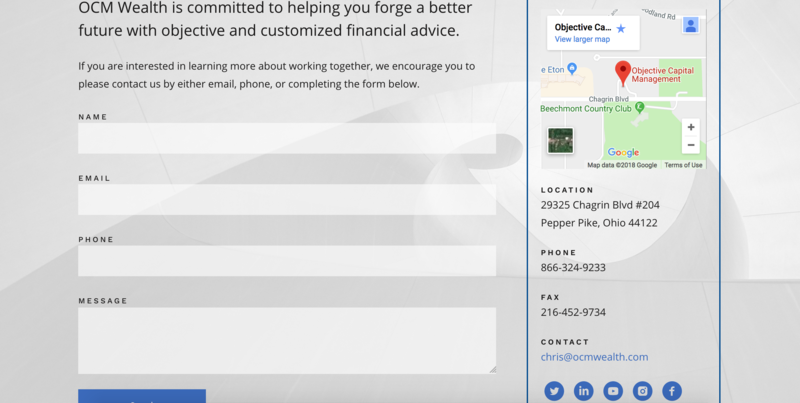 Twenty Over Ten client, Objective Capital Management, site is a great example of a well laid out contact page. Including a contact form on your contact page can also give potential clients an opportunity to send quickly send you a message or ask a question. This is very helpful and gives you a great start to gaining a new client. If you want customers to have an easy way to make appointments on your website, you can use scheduling software like Calendly or ScheduleOnce. By following these tips, you’ll be maximizing the areas of your site where customers will spend the most time and learning the most about your firm. Get ready to see results in no time!